Greater St. Mark Church Of God In Christ - Greater St. Mark Church Of God In Christ - G.S.M. Womens Dept. The largest department in C.O.G.I.C. is the Women's Department. Women in C.O.G.I.C. have been influential in the leadership and organization of the church since its inception. The church believes that women are gifted and called to ministry; it does not, however, officially ordain women to the office of elder, pastor, or bishop. In 1911, Bishop Mason though opposed to the ordination of women, established a unique and complementary ministry to promote the work of women in the church. Historically, women in ministry in C.O.G.I.C. are known as missionaries and are designated in two categories— Deaconess Missionary and Evangelist Missionary. Deaconess Missionaries serve and assist in the ceremonial and temporal affairs of the local church. Evangelist Missionaries are licensed to teach the gospel, conduct gospel meetings, and may be given the oversight of local congregations serving as the church administrator. A General Supervisor of Women is appointed by the Presiding Bishop and given authority to lead the International Women's Ministry of the church. 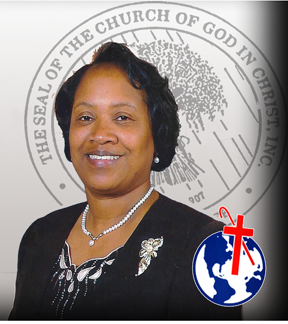 Each jurisdictional bishop appoints a jurisdictional supervisor to lead the work of the women on a jurisdictional level. The jurisdictional supervisor is assisted by district missionaries who oversee the women's ministry of the district. Recognizing the call of women to the ministry, C.O.G.I.C. has created numerous positions that allow women to work as counterparts to the department presidents as chair ladies (Y.P.W.W.) and Elect ladies (Evangelism). On the local church level, C.O.G.I.C. developed and has maintained the position of the "church mother." Church mothers have historically served as the leader of the women's ministries in the local congregations. The designated church mother along with other "older and seasoned" women of the church provided the practical teaching of holiness in daily life and practice. Today however, many church mothers have been reserved to titular positions as many pastor's wives have assumed the role of leader of women's ministries in local congregations. Despite what seems to be obvious limitations to minister because of ordination, women have been given great latitude and numerous opportunities to serve in ministry in C.O.G.I.C.. As a result, many local congregations, foreign missions, and schools were established and through the leadership and efforts of women in C.O.G.I.C..
Lizzie Woods Robinson (1911–1945) was the first "General Mother" of the church. Finding two groups of women in the church, one group praying known as the Prayer Band, the other group studying and teaching the Word known as the Bible Band, she combined the two under the name of the Prayer and Bible Band. She organized the sewing circle and after meeting Elder Searcy, she encouraged the women to support mission work through the Home and Foreign Mission bands. As the church continued to grow, she began state organizations and appointed the first state mothers. Mother Robinson was a staunch advocate for holiness and taught strict guidelines for the women with regard to dress and worldliness. She was greatly interested in the building of Mason Temple and she kept her national building fund drives functioning until she knew the building was ready for dedication. When she died in 1945, she had laid an impressive foundation for the women's ministry in C.O.G.I.C. Her successor, Lillian Brooks Coffey (1945–1964) was the organizer of the Women's International Convention. The first Women's Convention was held in Los Angeles, CA, in 1951. Today the International Women's Convention/Crusade meets annually in May in various cities throughout the nation drawing thousands of women from around the world. Mother Coffey was a child convert to C.O.G.I.C. under the preaching of Bishop Mason. Mother Coffey was also most influential in organizing many of the auxiliaries, bands, and units that exist within the C.O.G.I.C. Women's Department today. The most active women's auxiliaries include: Prayer and Bible Band, Christian Women's Council, Home and Foreign Mission Bands, Young Women's Christian Council, Purity Class and the Sunshine Band. Mother Coffey also began the use of the title "Jurisdictional Supervisor" for state mothers as more jurisdictions were forming in each state. After the passing of Mother Coffey in 1964, Dr. Annie L. Bailey (1964–1975) became the third General Supervisor. Mother Bailey was the wife and companion of Bishop John Seth Bailey, a trusted advisor of Bishop Mason and later the first assistant presiding bishop of the church. Mother Bailey along with her husband, modeled the pastor and wife ministry team in C.O.G.I.C.. She led the International Women's Convention in becoming a training institute for women in the ministry. She served as the jurisidictional supervisor of several states helping to establish and stabilize struggling jurisdictions. Dr. Mattie McGlothen (1975–1994) the fourth General Supervisor, was a tremendous organizer and had a great impact on the development of the Women's Department as well. She established new auxiliaries for the department including the International Hospitality Unit, the Educational and Bishop's Wives Scholarship funds, the We 12 and Lavendar Ladies to name a few. Internationally she built a home for missionaries in the Bahamas, a pavilion for senior citizens ans unwed mothers in Port-au-Prince, Haiti. She also established the Mattie McGlothen Library and Museum in Richmond, CA as a resource for C.O.G.I.C. historical facts and memorabilia. Finally, she changed the visible presence of women in ministry with the introduction of the ministry "habit". Today thousands of C.O.G.I.C. women when ministering the gospel or serving in official capacities are seen in their civic (black) or ceremonial (white) habits. After the demise of Mother McGlothen, Mother Emma F. Crouch (1994–1997) of Dallas, TX served as the fifth General Supervisor. Although her tenure was brief, she encouraged the women to stay focused and supportive to the leadership of the church. One of her contributions was to divide the women's fellowship in the local congregations into two groups: The Christian Women's Council for the middle aged and senior women of the church as well as the Y.W.C.C. for the younger women. The current General Supervisor of Women is Mother Willie Mae Rivers (1997–present) of Goose Creek, South Carolina. Mother Rivers is committed to strengthening the auxiliaries in the local churches and to prepare the younger women to carry the mission of C.O.G.I.C. into the Twenty-First Century.